Unlike the freak heat wave last year that overloaded the medical staff with many cases of heat stroke this years weekend provided the normal Monterey weather, Fog in the morning and comfortable warm temperatures in the afternoon. The vendors had reasonable prices and plentiful suplies of water so race fans could stay hydrated. 2007 Red Bull U.S. Grand Prix - Dani Pedrosa: Dani Pedrosa between the Corkscrew and turn 9. Taken at 125th shutter speed so the spokes are invisable. The U.S. Grand Prix MotoGP race was not friendly to the American riders. At the start of the race Nicky Hayden (Honda) and John Hopkins (Suzuki) collided in the first turn and put them both out of contention, Nicky Hayden retired with 10 laps to go ending his hopes to win his third U.S. Grand Prix in a row. John Hopkins finished in 15th place. 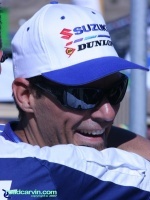 Kurtis Roberts retired after several laps. 2007 Red Bull U.S. Grand Prix MotoGP - John Hopkins: John Hopkins Leaning in turn 9 in Friday's 2nd MotoGP practice session. 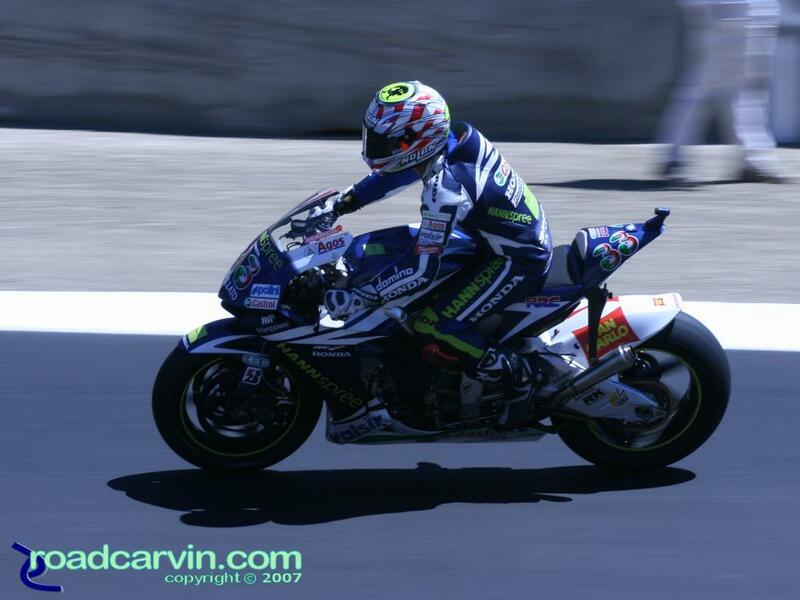 Friday Photo - Kurtis Roberts: This Friday photo is for all the Roberts fans, Kurtis Roberts in Turn 6 at Laguna Seca. 2007 Red Bull U.S. Grand Prix MotoGP - Anthony West II: Anthony West, Kawasaki Racing Team. Casey Stoner broke the MotoGP pole jinx by dominating the race weekend. Casey cruised to victory with almost a 10 second margin of victory. Chris Vermeulin rode a solid race but could not stay with Stoner. 2007 Red Bull U.S. Grand Prix - Shinya Nakano: Shinya Nakano riding the Konica Minolta Honda. 2007 Red Bull U.S. Grand Prix - Valentino Rossi Turn 6: Valentino Rossi in Turn 6 taken at 1/250th and 250 focal length. 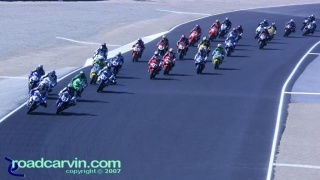 While the MotoGp race was never really in doubt the AMA Superbike race presented by Parts Unlimited was very exciting and provided race fans with riders racing for position from start to finish. 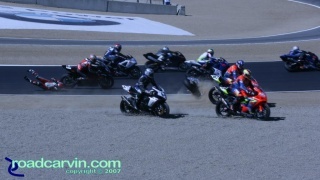 The AMA Superbike race did have a similar start with a big crash at the start. 2007 Red Bull U.S. Grand Prix - AMA Superbike Start: Start of the AMA Superbike race at Mazda Raceway Laguna Seca. 2007 Red Bull U.S. Grand Prix - AMA Superbike Start - Crash: Crash at the start of the AMA Superbike race. 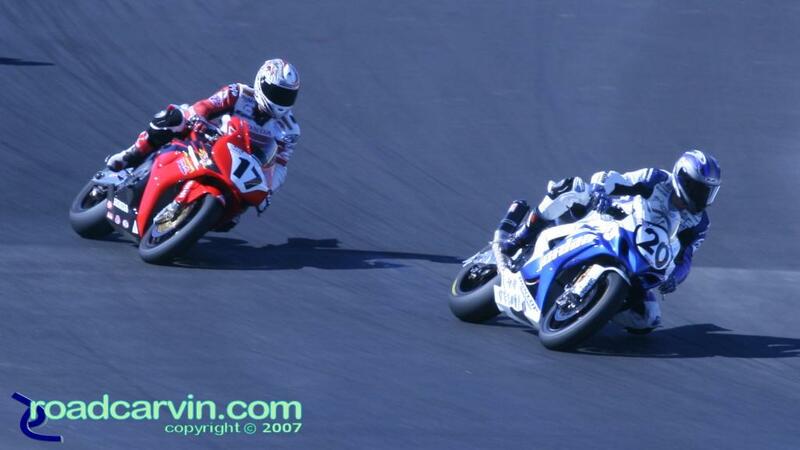 2007 Red Bull U.S. Grand Prix - AMA Superbike - Tight Racing: There was tight racing at the front in the AMA Superbike race. 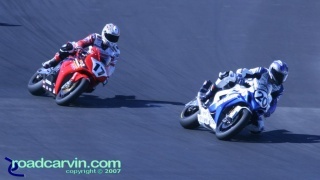 2007 Red Bull U.S. Grand Prix - AMA Superbike - Duhamel Chasing Yates: Miguel Duhamel chasing Aaron Yates in a fight for 3rd place. 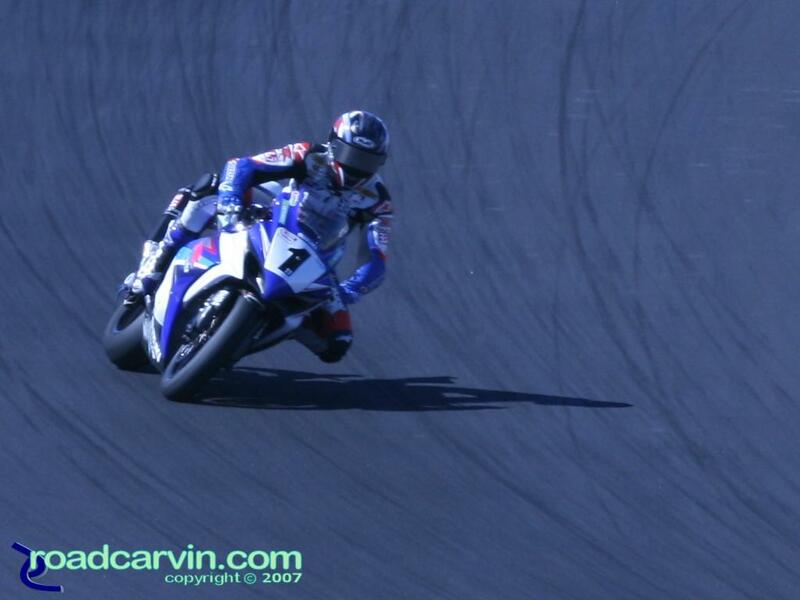 2007 Red Bull U.S. Grand Prix - AMA Superbike - Ben Spies Turn 2: Ben Spies cruising through Turn 2 at Mazda Raceway Laguna Seca. 2007 Red Bull U.S. Grand Prix - AMA Superbike - Aaron Yates (II): Aaron Yates gets a hug after his 3rd place finish for Jordan Suzuki. Author: Dwight Domonkos /// submitted on July 24, 2007 - 3:29pm. 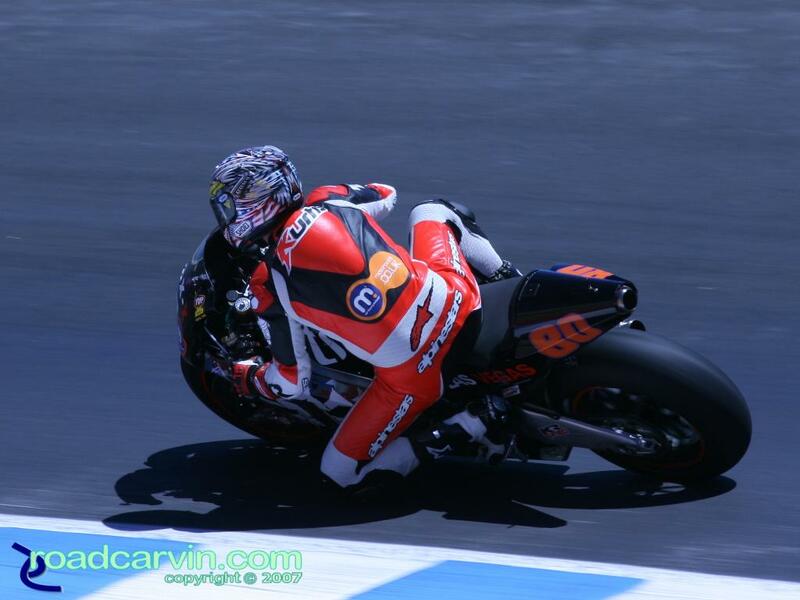 Casey Stoner rode great all weekend and his Ducati performed flawlessly.